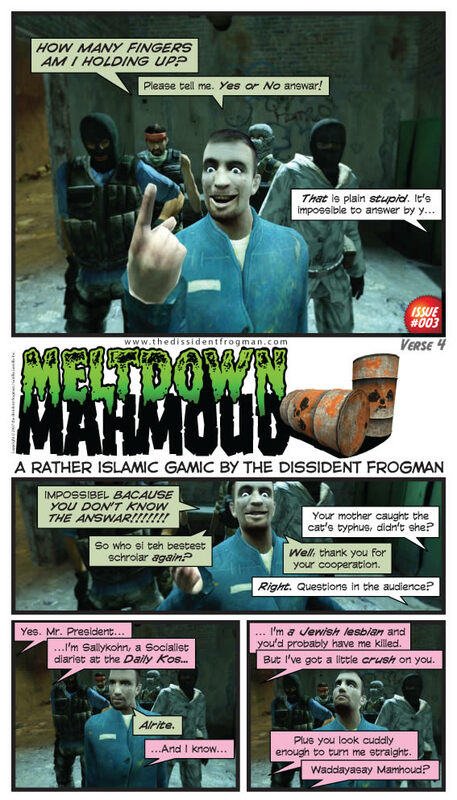 Meltdown Mahmoud issue #003 is out. Believe it or not, but I actually read the transcript of Mahoud Ahmadinejad's "lecture" at Columbia University through and through, which would be a complete chore if it wasn't for the no-barrels-held bitchslapping handed to Mad Mahmoud by Lee Bollinger — come on, even if you disapprove of Columbia U welcoming the Iranian thug-in-chief, you have to admit that seeing him called a "petty and cruel dictator (...) quite simply, ridiculous (...) either brazenly provocative or astonishingly uneducated" was priceless — as well as the high level of unvoluntary humor offered in this Ahmadinejadian intervention, by the horse's mouth itself. 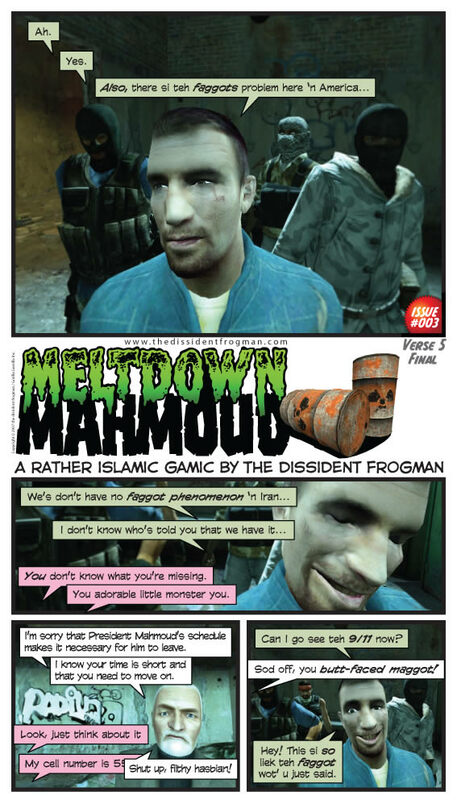 Add to that an expose in self-hatred from a certain "Jewish lesbian" Lefty who hates Bush (and herself) so much that she finds Mahmoud attractive, and you've got more than enough material for a third installment of Meltdown Mahmoud — introducing this time, The Mahmoud himself. It is almost surreal to see how the far lefties in this country have been tripping over themselves to show support for Ahmadinejad’s visit not only to Columbia, but even worse, to Ground Zero, and they’ve attempted to “justify” it by claiming that he’s not as bad as the Bush administration has painted him out to be. Pointing out liberal Democrats what Ahmadinejad has said and done since he’s been the “leader” of Iran doesn’t do any good, as reason is lost to the Bush-hating left, who I believe wanted him to visit Ground Zero because of the embarassment it would have caused President Bush. To the far left, nothing is sacred when it comes to taking down the President - America’s reputation in the world be damned, as long as it brings down “BushCo.” This is why, I think, they want us to cut and run from Iraq. It’s not so much that they “hate war” - they just hate this war, because a Republican president has waged it. They’d rather see us lose face in Iraq, and by extension the world, strictly because they know it’d be a huge defeat for Bush. They don’t care that it would hurt America, too, in more ways than one. That the Daily Kos Jewish lesbian diarist admits that she has a “little crush” on Mahmoud unfortunately fits in with this emerging theme I’ve seen this week on a couple of blogs and at least two mainstream media news sites, where the debate was/is about whether or not Ahmadinejad is “hot.” I wonder if it’s even occurred to them that they wouldn’t have the right to have lame discussions like that if they lived under his rule in Iran. Probably not, as “thinking” has long been an outdated concept to the clueless wonders on the far left end of the political spectrum. The left in this country has completely lost it. This is just one more example of how low they’ve fallen. Monsieur, you are the Molière, the Voltaire, the Brétécher of our times. Thank you. 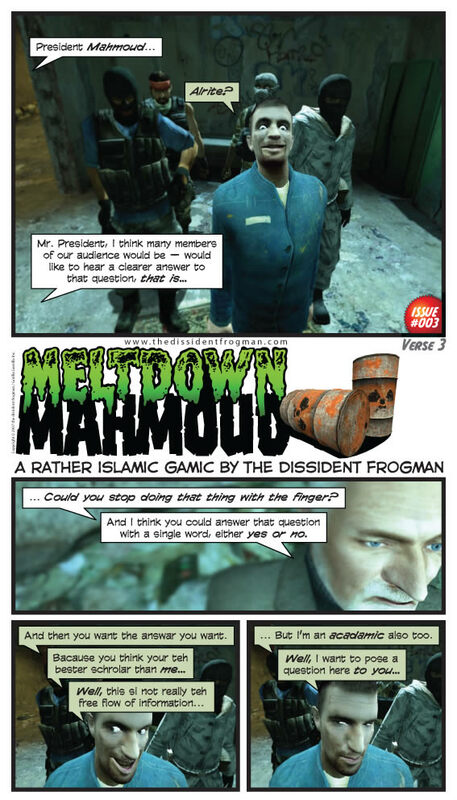 hi Dissent Frogman ! I loved it. It was fantastic work ! I really have to say Sister Toldjah covered what happen here very thoroughly….I agree 100%......!!!!!!! Oh Sister, you are so completely on target! I can only hope that the comments/opinions/stances of these sublimely ridiculous leftards come as a cold slap of reality to those leaning toward the left or those sympathetic with the left. What absolute complete idiocy! Didn’t Eva Braun have this same problem? DF - OMG! 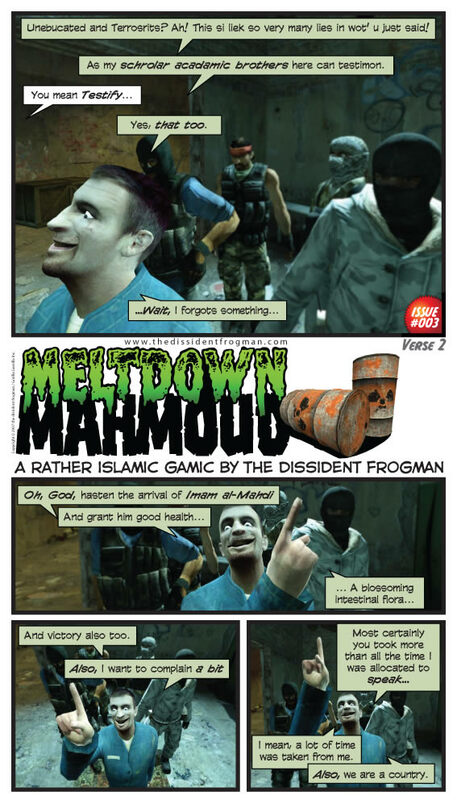 The absolute BEST Meltdown Mahmoud EVER!! Just great!!! I’m still laughing. It keeps getting better. Keep up the good work! Now I think I’m in love. (Not with Mahmoud Ahmadinejihad…. that would be repulsive. We’ll leave that to Jewish Lesbians.) With French Froggy. That was technically and artistically perfect. The Goon Squad standing behind him was the best. Merci beaucoup for the laughs! 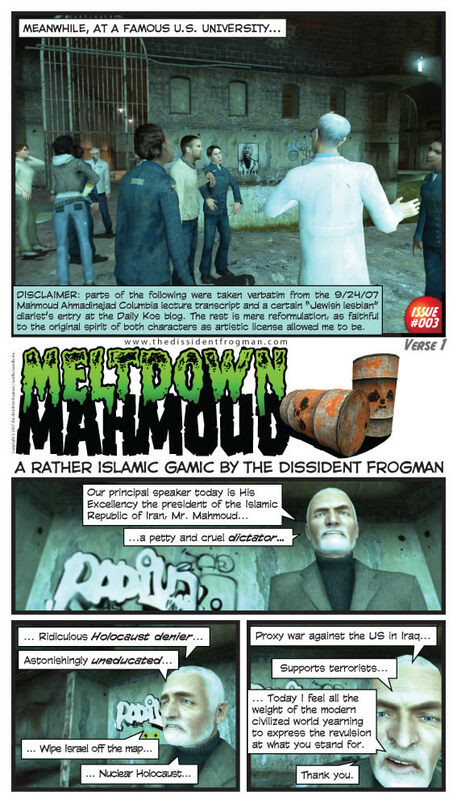 The supremacy of teh DF ash only a way to be explained: eh’s clearly teh mahdi guy tath meltdown MA raves and raves about.